When we entered the Athens Farmers Market today, a lot of things had changed, the area looked like it was paved again and the sidewalk was taken out! 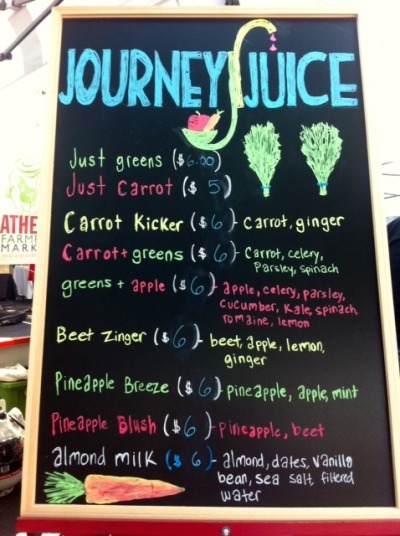 Even though it was sunny, something caught our attention… It was the Journey Juice stand! In our opinion Journey Juice is a welcoming place, very colorful, along with some very tasty juice. It is good when a kid thinks something vegetable is good, that is good! :) But, not all their juices are just vegetable. The juices have all sorts of interesting flavors such as Beet Zinger and Almond Milk including much more. Those two are our personal favorites. Here we have the inside scoop on all things Journey Juice. We talked to a staff member of Journey Juice and she gave us some cool information. Right now their juices are a regulated list. (Kind if like a theme.) But, they do plan on adding different flavors over time, such as watermelon for summer juice. This staff member loves that she can help sell healthy juices that she knows will benefit people! She also loves coming to the farmers market and get to meet new people, and tell them more about Journey Juice. In case you are in debate about what flavor to buy, at the farmers market more people tend to buy the Beet Zinger and Carrot Greens, but at the store more people buy more green like juices. A customer we interviewed said that her favorite juice is Just Greens. What she likes about Journey Juice is that it has a nice setup and you get to try the juices to see which one you like best. She is here at the Athens Farmers Market every Saturday to buy things for dinner and her weekly groceries. She loves that she can come here and not have to go to Kroger and other stores like this to substitute local things that she can get here. “It is a great community and I love coming here!” says Miss Erin. The Athens Farmers Market is a great place to buy locally grown and locally made foods. You can enjoy yourself on a Saturday mornings and Wednesday afternoons. It is a cool place to hangout and have fun!!! SATURDAYS - DOGS ALLOWED IN FRONT OF PAVILION OR "IN ARMS" UNDER THE PAVILION. WEDNESDAYS - DOGS ALLOWED IN COURTYARD ONLY.